Location, location, location. 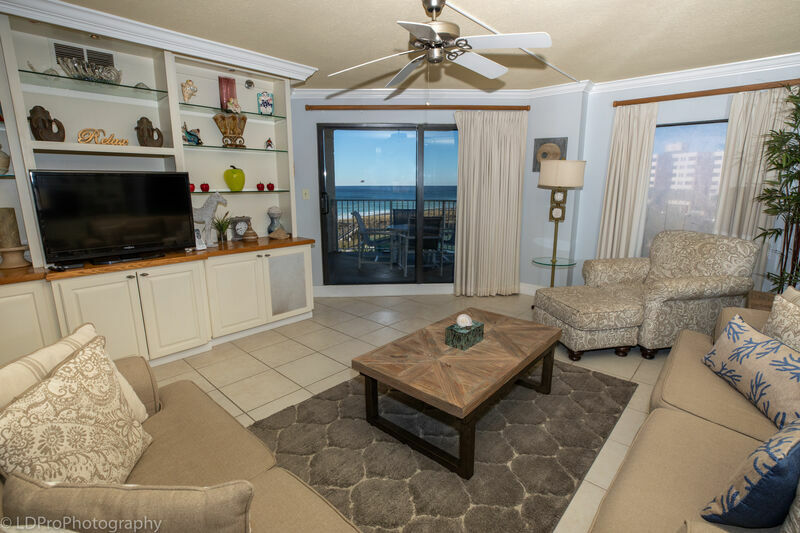 Inlet Reef 310 is the closest west side 2 bedroom to the beach on the third floor. The star of this condo is the Gulf View. The neutral colored sofa makes sure not to distract from the amazing view you can see from the cozy sofa that also doubles as a Queen Sofa Sleeper. There is additional seating of a love seat plus plush comfortable chair and matching ottoman. The living room features wall to wall entertainment center which includes 42" flat screen TV and DVD player and custom drapes. Dining area comfortably seats 6 and includes built in wet bar. Spacious kitchen has a full size refrigerator, oven, and dishwasher plus all the cookware you will need to cook your catch of the day. Adjacent to the kitchen is a dinette area that seat 2 and a Full size Washer & Dryer. The guest bedroom has two Twin beds, a ceiling fan and a wall mounted Flat Screen TV. The Guest bathroom has a combination tub/shower. Master bedroom has King size bed decorated West Indies and has flat screen TV + DVD player. Large granite makeup area separates master bedroom from master bath which has granite vanity plus deluxe walk in shower with decorator glass wall tiles. Spacious balcony includes wet bar with outside cabinets. The balcony overlooks the beach, the pool area which includes the sun deck and barbecue area. Condo amenities include FREE seasonal beach service ( 2 chairs & an umbrella), wireless internet, & a washer and dryer. Loved our stay at the inlet reef 310. Our kids loved the pool and easy beach access. Staff members were very prompt and friendly. The only negative thing I would say is the construction that was going on in the condo next door. We had to leave our condo a few times because of the noise but understand renovations have to happen. Other than the construction we have no other complaints and will be back again! Note From Holiday Isle Properties: We are so sorry to hear your stay was less than perfect. We strive for every guest to have the perfect vacation and unfortunately there was a unit nearby that was being remodeled causing the noise you heard. The unit has since been completed and the noise issue is now resolved. Thanks for staying with us and we hope to see you again.